The non-waiver trade deadline for Major League baseball came and and went this afternoon at 4pm. 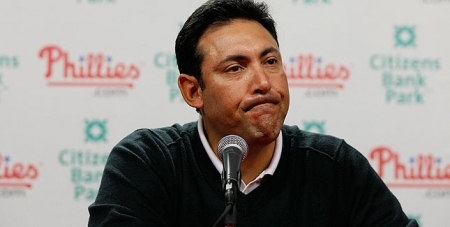 The Philadelphia Phillies and General Manager Ruben Amaro Jr did not make any moves. Despite weeks of talk leading up to deadline about what the team should, could, might do there was nothing in the end. Third baseman Michael Young was closest option to trade but all offers came up 'unsatisfactory.' Pitchers Jonathan Papelbon and Cliff Lee were also possibilities but apparently there were no serious talks. Chase Utley is apparently in negotions with the Phillies on a possible contract extension for 2 maybe 3 years at $13 million a year. With the deadline past trades can still happen in August, players will just have to go through waivers. Philadelphia Eagles wide receiver Riley Cooper has issued an apology after video surfaced of him shouting a racial slur during a Kenny Chesney concert at Lincoln Financial Field back in June. Before that concert, Cooper was also involved in a verbal confrontation with two men in the parking lot that was also caught on video. Both incidents were reported on the Crossing Broad blog. In the latest video, Cooper is shown inside the concert yelling at some one saying, “I will jump that fence and fight every n***** here.” He is calmed down by a friend. At a press conference today Cooper insisted that the incident was out of character. He had been drinking at time but it is not an excuse. He explained that it was a confrontation between him and an African-American security guard. He has been fined by Eagles owner Jeff Lurie, head coach Chip Kelly and general manager Howie Roseman. A teenager has been arrested for stealing bikes from a Camden school. He is being charged with 3rd degree burglary and 3rd degree theft. The teen was not alone. Multiple suspects broke into East Camden Middle School on Stevens Street early Friday, stealing six specialized mountain bikes used by a youth club. They also took an overhead projector, three computers and a keyboard and amplifier from a music classroom together worth $6,000. anyone with information about the incident is asked to call the CCPD tipline at (856) 757-7042.